Following the first reported transcatheter device closure of VSD by Lock et al., it has become the procedure of choice for most muscular VSDs. However, device closure of apical muscular VSD can be challenging particularly in a hypertrophied and highly trabeculated right ventricle (RV). Device closure of an apical VSD in a child who had coarctation repair with pulmonary artery (PA) banding is described in this case report. The importance of two-dimensional transesophageal echocardiography (2D-TEE) during the cardiac intervention is highlighted. Institutional Medical Ethics and Scientific Research Committee approval (SRC/CR#10/2017) and an informed consent from the baby's parents were obtained to publish this report. A 1-year 5-month-old male child [weight (wt): 11.8 kg; height (ht): 82 cm, and body surface area (BSA): 0.5 m2] was admitted to the author's tertiary care center for an elective device closure of a large apical muscular VSD followed by surgical PA debanding. During the neonatal period, the child was diagnosed to have Type A interrupted aortic arch with multiple VSDs by transthoracic echocardiography. Aortic arch repair with PA banding was performed through a midline sternotomy when the child was 9 days old. During the current admission, a hybrid procedure of perventricular VSD device closure was planned. However, in view of redo-surgery, an initial attempt at transfemoral device closure of the VSD was felt reasonable. General anesthesia was administered to the child under standard American Society of Anesthesia monitoring guidelines. In addition, invasive hemodynamic monitoring was performed in the form of right radial artery and right internal jugular vein cannulation. As it was a redo-surgery and keeping in view the possibility of arrhythmias during the interventional procedure, transcutaneous pads were applied to the chest wall of the child, following induction of anesthesia, to facilitate intraoperative external pacing, cardioversion, or defibrillation. Device closure of the VSD was performed successfully primarily under 2D-TEE guidance in addition to conventional fluoroscopy that was sparingly used. 2D-TEE helped the successful deployment of the device helping in overcoming several difficulties during the procedure. The VSD had a rim of about 6 mm toward the apex, was 7.6 mm in diameter at its widest on the left ventricle (LV) side and about 5 mm on the RV side. The RV was much hypertrophied and trabeculated. There was difficulty in negotiating the guide wire and catheter through the RV cavity. The mid-esophageal four-chamber view confirmed the correct placement of the guide wire and the guiding catheter demonstrating that they were negotiated through the actual VSD orifice [Figure 1]. The moderator band was adjacent to the superior edge of the VSD making the superior edge thicker than usual. Attempts were made to occlude the VSD with a 12/10 mm Amplatzer duct occluder (AGA Medical Corporation, Plymouth, MN, USA). TEE showed that the duct occluder was unstable after deployment. The moderator band and the thickened superior rim of the septal defect were preventing RV disc expansion during deployment and were causing the device to slip into the RV. Even after deployment, the device was slipping into the LV due to a milking action caused by the peculiar shape of the defect [Figure 2]a. Subsequently, a 12 mm Amplatzer Muscular VSD occluder (AGA Medical Corporation, Plymouth, MN, USA) was used and successfully deployed under traction to prevent it from slipping into the LV [Figure 2]b. 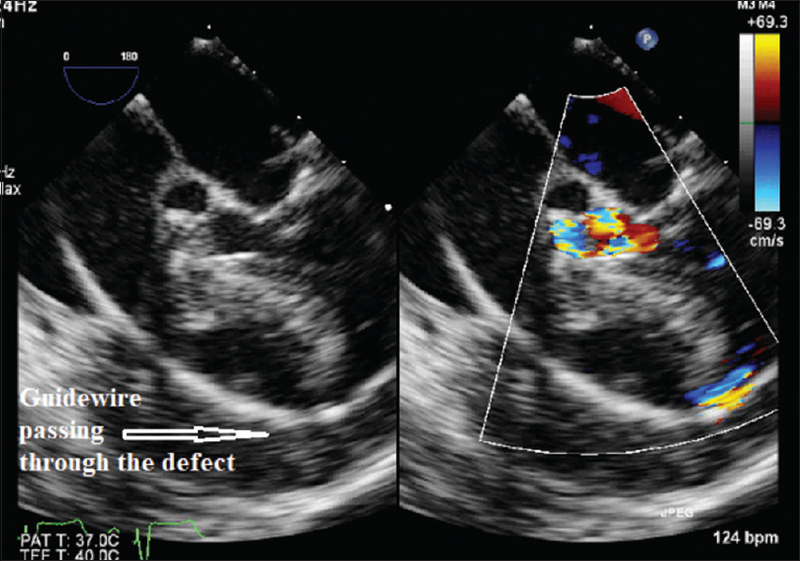 There was minimal shunt across the defect and no other defects could be visualized in the ventricular septum. Since the RV systolic pressure was suprasystemic after the device closure, PA reconstruction was performed immediately thereafter in the same sitting. The child had a smooth postoperative course. The child was discharged home on the 5th day after confirmation by transthoracic echocardiography that the device was securely in place. Muscular VSDs account for 10–15% of congenital VSDs. Apical defects are the most common form of muscular VSDs, followed by the mid-muscular type. Though traditionally surgical closure was in vogue, a surgical approach is associated with considerable morbidity and mortality due to inadequate exposure leading to technical difficulties, and incomplete closure.,, Sometimes a surgical approach might necessitate a left ventriculotomy that might result in LV impairment, apical aneurysm, or ventricular arrhythmias.,, Excellent closure rates of VSDs following percutaneous and/or perventricular closure of hemodynamically significant muscular VSDs with the Amplatzer Muscular VSD occluder have been reported. A serious concern of percutaneous VSD closure is the occurrence of complete atrioventricular block necessitating permanent pacemaker implantation. Left bundle branch block following device closure of a muscular VSD that progressed to a complete heart block later was a major complication reported. The child in this report did not develop any conduction problems. Another problem that must be kept in mind during device closure of intracardiac septal defects is embolization of the device either to the right- or left-sided heart chambers. The reported incidence of embolization of VSD devices is about 0.9%. Embolization of devices to the left-sided heart chambers can be catastrophic. In most such cases, emergency surgical retrieval of the device and patch closure of the VSD on cardiopulmonary bypass is indicated. However, transcatheter device retrieval even when the device has migrated into the PA or into the aorta with subsequent successful implantation of a larger device has been described suggesting an alternative to open heart surgery. After deployment TEE aided in demonstrating the correct positioning of the device and color Doppler showed absence of residual shunts. In conclusion, 2D-TEE during transcatheter cardiac interventions can be a valuable adjunct to fluoroscopy aiding in the precise assessment of septal defect boundaries, guiding the passage of catheters through the defects avoiding creation of false passages, assisting in the selection of appropriate device size, and helping in the positioning of the device accurately. TEE can check for post-procedure residual leaks or pericardial effusions. Lastly, the frequency of fluoroscopy can be reduced when assisted by TEE, reducing the radiation exposure to the patient as well as the intervention team. Thanopoulos BD. Catheter closure of congenital muscular ventricular septal defects. Pediatr Cardiol 2005;26:220-3. Thanopoulos BD, Rigby ML. Outcome of transcatheter closure of muscular ventricular septal defects with the Amplatzer ventricular septal defect occluder. Heart 2005;91:513-6. Djer MM, Latiff HA, Alwi M, Samion H, Kandavello G. Transcatheter closure of muscular ventricular septal defect using the Amplatzer devices. Heart Lung Circ 2006;15:12-7. Lock JE, Block PC, McKay RG, Baim DS, Keane JF. Transcatheter closure of ventricular septal defects. Circulation 1988;78:361-8. Holzer R, Balzer D, Cao QL, Lock K, Hijazi ZM. Amplatzer muscular ventricular septal defect investigators. Device closure of muscular ventricular septal defects using the Amplatzer muscular ventricular septal defect occluder: Immediate and mid-term results of a U.S. registry. J Am Coll Cardiol 2004;43:1257-63. Butera G, Carminati M, Chessa M, Piazza L, Abella R, Negura DG, et al. Percutaneous closure of ventricular septal defects in children aged <12: Early and mid-term results. Eur Heart J 2006;27:2889-95. Carminati M, Butera G, Chessa M, De Giovanni J, Fisher G, Gewillig M, et al. Investigators of the European VSD Registry. Transcatheter closure of congenital ventricular septal defects: Results of the European Registry. Eur Heart J 2007;28:2361-8.